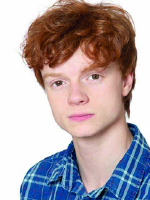 My name is Freddie (playing Jack), I’m 19 with no theatre experience (although I did appear in the films Nativity! and Nativity 2: Danger in the Manger!) and, like the other young actors with limited theatre experience, naturally terrified. The first day of the rehearsal process, when you are in the room with the creative team about to do your first read through of the play, came with that classic mixture of emotion. You assume it’s going to be like boot camp from day one, and I know in the long run it will be, but at today’s first rehearsal it seemed calm; the sanity of the actors was definitely being looked after! You are going to have a great creative master class with both directors and regent park Compnay ! Enjoy ! Look forward to seeing it ! Just found this blog Freddie……….. so how about an update as you finish the run ? I’ve seen the show four times and you were all OUTSTANDING!!! Well done everyone, a really touching and emotive production and one that deserves awards and wider recognition.